We produce of Precious Metal Alloys. Buy now From stock or special order. BariteWorld produces an array of precious metal alloys containing platinum, silver, ruthenium, gold, palladium, etc., prized in industry as coatings for their high chemical resistance, electrical conductivity, & catalytic potential. Using e-beam melting, we can make very small packages of 1 gram to 25 grams or larger pieces. Call or Email us for a quote. At BariteWorld, we are a great source for many precious metals and alloys. We melt and machine all alloys in house and have developed a recovery program that minimizes reclamation costs. 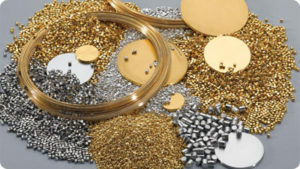 Our goal in providing the Noble Metals to the customers is to always provide high quality and cost efficient material. We produce, in-house in our 90,000 square foot plant located in USA, our own precious metals alloys for industrial applications in the form of Strip, Sheet, Wire, Rod, and Casting Grain.